Then, about three years ago, he made his directorial debut with the unnerving, artificial-intelligence thriller “Ex Machina,” which he also wrote. Not only was this one of the best films of 2015, but it also showed that Garland had a promising career as a filmmaker. Afterwards, I couldn’t wait to see what his follow-up project would be. In his second go-around as a director, Garland continues to fascinate with his sci-fi film, “Annihilation,” which is based on the first novel in JeffVanderMeer’s “Southern Reach Trilogy.” Bolstered by a talented cast, disturbing and gorgeous visuals, and a multilayered story, Garland offers further proof that he’s one of our next great sci-fi visionaries. Lena (Natalie Portman) is a biologist and former soldier whose military husband, Kane (Oscar Isaac), has been missing for almost a year after leaving for a mysterious assignment. When he returns as the sole survivor of his team, Lena’s taken to a research facility and learns that Kane and his group were exploring a quarantined zone called “The Shimmer,” where the creatures and landscapes inside have experienced mutations. 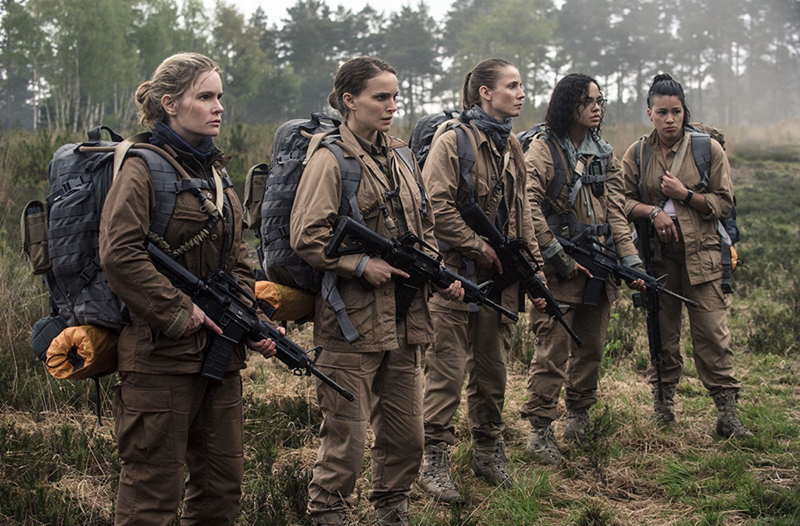 Lena soon joins an expedition with psychologist Dr. Ventress (Jennifer Jason Leigh), paramedic Anya (Gina Rodriguez), physicist Josie (Tessa Thompson), and surveyor and geologist Cass (Tuva Novotny) to find a way to destroy “The Shimmer” before it expands across the world. Natalie Portman delivers an effective lead performance as someone whose life has been upended by the disappearance of her husband, only to be thrown off balance even more by the scientific and dangerous phenomenon at hand. Portman’s work in this film brings out the uncertainty that her character felt before the events of the movie and continues to feel, exhibiting a closed-off persona that gives us an idea of how much emotional unrest her husband’s disappearance and troubling reappearance have caused her. However, Portman’s character still displays an invigorating strength that she knows must be used in order to complete the team’s mission. As far as the supporting performances go, Leigh, Rodriguez, Thompson, Novotny, and Isaac are each given a scene or two in which they have the opportunity to stand out. This is particularly the case with Rodriguez, in which she gets to be the center of one of the most-disturbing scenes in the film and let her acting abilities add a lot to the terror of this sequence. Just like what cinematographer Rob Hardy accomplished with “Ex Machina,” he captures the lushness and colors of the environment of “The Shimmer”while juxtaposing the fatal dangers hiding within. What’s so effective about the way Hardy photographs the landscapes of “The Shimmer” is how fully he presents them. Whether it’s through a long shot that allows us to see the intimidating expanse of “The Shimmer,” or a close-up where we see the smaller details of the surroundings, the visuals are filled with a beauty that amazes as much as it haunts. Despite a rather-unnecessary subplot that’s brought up for two quick scenes, Garland’s screenplay is one that keeps you tense throughout. Most of the story, while enshrouded in mystery, is still pretty straightforward, but the final 15 minutes or so are a mind trip that will have you theorizing the events of the movie right after you leave the theater. This is a narrative that takes its time in unraveling the secrets within “The Shimmer,” all while giving us a couple of scenes that frighten us without overstaying their welcome. Seeing as Portman plays the main character, Lena’s backstory is given more attention than those of the four other researchers; however, with that quartet of supporting characters, we’re given a little bit of backstory for each of them that’s just enough to let us understand their actions, but it’s not so much that it detracts attention from the enigma that the film presents. As a director, Garland once again shows that he’s a master at tension, especially in a climactic scene where Portman’s character must confront“something” (I put that in quotations because I don’t want to give anything away). He constructs this scene in such a way that I felt a tightening in my chest as this sequence took place. And, as great as this scene is, it’s almost a relief when it’s over because of how breathless it made me feel, and the unsettling score from Ben Salisbury and Geoff Barrow (who composed the music for “Ex Machina”) heightens the scene’s impact. Given the quality of his first two movies as a filmmaker, Garland is someone who has a long career ahead of him behind the camera. For more than a decade, he’s shown us the wealth of stories he can present to the sci-fi genre, and his transition from a writer to writer-director has opened up new possibilities of what can emerge from his talent. With “Ex Machina,” and now “Annihilation,” it looks like Garland will use his skills as a director to further empower his ability to engage audiences with his intelligent narratives. If this is what we can expect from him moving forward, then no matter what he thinks of next, I’m sure he will make us, as an audience, think.